Hello again from the Twin Cities! Even though the winter’s just beginning, all of us here are getting very excited about next summer. Us program leaders (Ruby Levine, Daria Kieffer, Libby London and Courtney Dowell) have been having a great time meeting with new and old community partners, hanging out on conference calls and sometimes even in person. Right now, we’re in the process of hiring a fourth program leader. More about us later, but first, our projects. We’re building off of a lot or the things we’ve been involved in for the past couple of years, and also starting up some new things. ARISE: The Ford plant in Saint Paul closed in June of 2011, and we’ve been working with the Alliance to Reindustrialize for a Sustainable Economy (ARISE) for a couple of years now to turn the plant into a mixed use green manufacturing site. Last year, a team of SOSers did a lot of outreach in the Highland community, which is where the Ford plant is located, in order to help the neighborhood get more involved. In addition, we worked on expanding a coalition of stakeholders, comprised on both individuals and organizations. A team of developer researchers also did extensive research on different possibilities for the plant, including anaerobic digestors. This next summer, we’ll be continuing a lot of this work and and are hoping to expand the coalition even further. 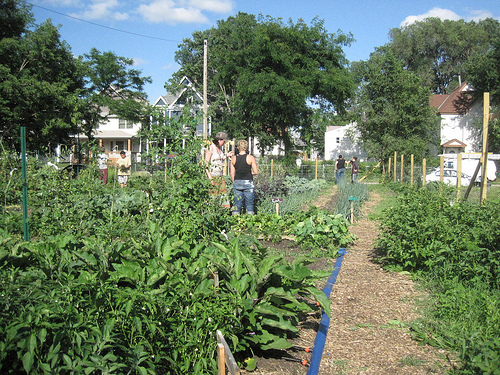 Urban Agriculture:In the past, we’ve worked with a variety of community partners, including the Harrison Neighborhood Association, the Concrete Beet Farmers, and YEACorps, just to mention a few. This next summer, we’ll continue to work with these organizations as well as hold weekly urban agriculture seminars, go on field trips throughout the Twin Cities, and start our own garden. Bike Access: We have been partnering with the Sibley Bike Depot in order to expand bike access across the Twin Cities. In the past, this involved supporting their outreach efforts by attending fairs and bike rides, as well as revamping their website and improving volunteer relations. This next summer, we’ll also be launching a program to help children in South Minneapolis access summer programming by biking together to the park. This program is in partnership with the Southside Youth Workers Engagement Groupand will bring in a variety of organizations. Energy Efficiency: Through the Our Power campaign, which is part of Grand Aspirations, we’ve been organizing neighbors in South Minneapolis to take control of their energy future by lowering their own energy use and mobilizing for community owned clean energy. We also train participants so that they can offer energy efficiency workshops and connect them with interested residents through Cooperative Energy Futures. Ruby Levine is a recent graduate of Macalester College in Saint Paul and has been a program leader since 2008 (she doesn’t really like vegetables). Courtney Dowell will graduate from the University of Minnesota this spring and has extensive experience organizing to get coal off the University of Minnesota’s campus (she is very fond of fried sweet potatoes). Libby London will graduate from the University of Minnesota this spring and has a background in community based art, biking and sustainability (she lives in the Powderhorn neighborhood). Daria Kieffer (me) is a junior at Carleton College who works with youth empowerment initiatives in Northfield, Minnesota and has been involved in SOS for the past two years (I’m trying to learn how to play the harmonica).